EXECUTIVE ACCESS: Guests staying at this 360 Blue property have access to limited golf tee times at Shark's Tooth and Camp Creek Golf Courses, the tennis courts at Shark's Tooth Club and complimentary use of any two kayaks, canoes and other amenities offered at the WaterColor boathouse for one hour at no additional charge during each day of stay. DETAILS: Our Seagrove Beach property, "Coast is Clear", epitomizes 30A living with it's exemplary coastal charm and unparalleled panoramic Gulf views. This masterful new construction 7 bedroom, 8 bath residence, offers over 5,000 square feet of pristine living space with ample room to sleep 26 guests. Prominently situated just two lots off the beach and perched at a high elevation, enjoy the beautiful 360 degree gulf views that span from Destin to Panama City Beach. The open floor-plan accentuates this property's generous proportions and thoughtful design throughout, with 12' ceilings and high-end finishes and furnishings. The first floor features a spacious entertainment area which includes a pool table and wet bar, all of which is open to the rear pool deck, perfect for entertaining. Bunk spaces as well as a full king bedroom suite with private bath are also located on the first floor. The second floor offers an open, generously-sized living space including a gourmet, well-stocked kitchen complete with Wolf & Subzero appliances. The second level also features a luxurious master suite with ensuite bathroom as well as a large bunk room. The third level boasts a large master suite complete with an ensuite bathroom as well as three additional guest bedroom suites and a spiral staircase access to the massive roof-top deck oriented to offer uncompromising sunset views and views over the Gulf of Mexico. 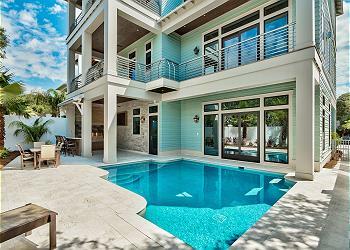 This home is enhanced by the new urbanism lifestyle it offers with close proximity to shops in Seaside town center, restaurants and local entertainment as well as the white sand beaches and emerald green waters of the Gulf of Mexico. 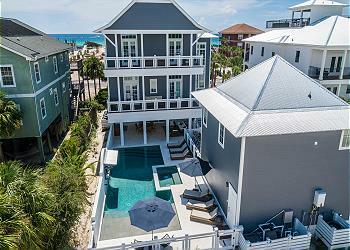 Give 360 Blue a call today to book this dream vacation home! 5 partial families. 7 days at the beach. Great times. We loved the house, and the service was top notch. Great location. Included bikes, beach set up, and golf cart were a huge hit. Will definitely try and rent again. If I had to nit pick...I might suggest stocking trash bags, paper towels, and soap/shampoo a bit better. Had to rush to store day 1 as the 2 included trash bags didn't last long. But all in all, we loved it. I would recommend without reservation. We couldn't have had a more beautiful place to host our intimate wedding on January 11, 2019. It was the perfect home to host our closest friends and family. From the awesome basement area with pool table where we had plenty of space for a bar and appetizers to the beautiful 2nd floor living area where we had a wonderful catered dinner and dancing. We can't wait to come back and make more memories! The only things we wished the house had: Blackout shades in the bedrooms! 360 Blue was very responsive with a couple of maintenance issues we had upon arrival, great company to work with. 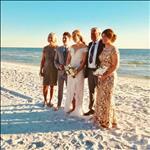 We are beyond thrilled that you all enjoyed your time with us for such a wonderful occasion in Seagrove! The photo you shared is absolutely breathtaking! We will be sure to share your feedback with our entire team. Thank you for staying with 360 Blue, we look forward to hosting you all again soon! Congratulations!! We are so delighted that you all enjoyed your stay with us in Seagrove! We are so appreciative of all of the hard work you all are doing in Panama City! Thank you for staying with 360 Blue, we hope to see you again soon! We loved our experience here! The house is unbelievably beautiful; fresh and impeccably clean. Every room is a lesson in luxury and design, down to the last detail. The rooftop deck is a trip to heaven, with its breathtaking view of sky and sparkling sea, (also visible from most bedrooms). The layout is perfect for large group togetherness, but also for finding a quiet corner to read. There were 12 of us, but the house could comfortably accommodate at least twice as many. It is a snap getting around. The house comes with bikes, which we rode to Grayton Beach State Park in about 20 minutes. The center of Seaside, which has a great variety of places to eat, is a 5-10 minute walk. The entrance to the beach is just across the street. (Close enough for convenience, yet very private). 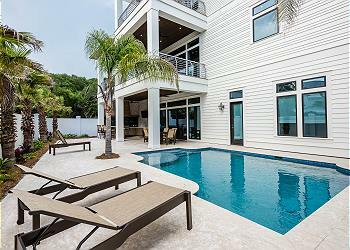 The house is located in an area that is right at the center of glorious Santa Rosa Beach. It extends as far as the eye can see in either direction. We had the entire beach to ourselves on most days... Coast is Clear is a perfect name for our beach experience! We hope to be back again. We are beyond delighted to hear how much you enjoyed your vacation with us in Seagrove! 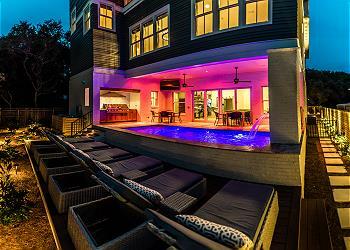 We completely agree this home is amazing and so accommodating! It's a perfect spot to enjoy a relaxing beach getaway and make lasting memories! Thank you for staying with 360 Blue, we look forward to seeing you all again soon!! We had an amazing time in your beautiful home! 5 families met from Florida and Georgia. The house consumed all of us and there so much room. The beach access was easy and the beach chairs were nice. We loved having the outdoor areas and the rooftop was perfect. A great time was had by all. We are so delighted that you enjoyed your vacation with us in Seagrove! We agree that this home is very accommodating for larger groups and families and the location is great! The photo you shared is absolutely adorable! We look forward to seeing you all again soon! 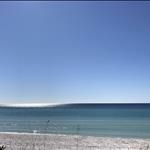 We are so thrilled that you all enjoyed your vacation with us in Seagrove! We agree that this home is perfect for larger groups and the location is perfect! We are so glad that your experience with 360 Blue was a positive one! We look forward to seeing you all again very soon! This was a beautiful property and we had a fantastic time. There was something for guests of all ages and the home was exactly as described. The rental process was seamless. We will definitely return. We are so delighted that you enjoyed your stay with us in Seagrove Beach! We agree that this home has wonderful accommodations and we are so glad that your experience was a positive one! We look forward to seeing you again soon! This was a beautiful home for an extended family vacation (13 of us total)... it was conveniently located away from crowded Seaside but a quick golf cart ride or car drive away & there was always easy parking. It was a 2 min walk to the beach, easy to walk to with our 3 toddlers. This is the 2nd year in a row we’ve used 360 Blue who have taken excellent care of us throughout our stay each time! The house was fabulous, a/c felt amazing, lots of room for people to spread out & the pool was also fabulous! Luxury at its best! The complimentary umbrella & 2 chairs for the beach that were set up daily & the bikes provided were perfect for families that had their hands full with toddlers and beach toys/ towels. We are overjoyed to hear how much you enjoyed your vacation with us for the second year! We agree that this home is a wonderful option for large groups or families and has all the accommodations you could want in a beach house! Thank you for sharing the photo with us, we always love to see the fun that was had by our guests. We hope to see you all again very soon! Our family enjoyed a beautiful Thanksgiving at Coast is Clear. The home is gorgeous and we couldn't have been happier with the accommodations. We had 15 family members for the festivities. We are a family of "foodies" - 2 professional chefs, 1- Restauranteur, 1 sous chef and lots of happy hungry others. The kitchen was outfitted with everything we needed. We cooked breakfast, lunch and dinner almost every day during our stay. We the enjoyed the game room and playing pool. The upper deck was a favorite spot for sunsets, morning coffee and star gazing at night. The Audio/Video system was a bonus when we watched the Macy's Thanksgiving Day Parade. We have fallen in love with Coast is Clear and hope to return for more of the same. Thanks to 360 Blue for taking care of our every need. Top notch first class!! We are so thrilled that you enjoyed your Thanksgiving getaway in this incredible home. It sounds like you truly found a home away from home that you can return to year after year. We loved having you with us and can't wait to have you back soon!